There are many reasons why Amazon coupons don’t work, sometimes it’s a seller’s mistakes and sometimes it’s on Amazon’s side. we will count here the common errors and explain about them, so as a shopper you will be able to claim more codes, and as a seller, you will know what is the problem with your coupons. Make sure that this is the only item in the cart, and you don’t have any other active discount code. Check if you are buying from the right seller. Some of the sellers ship the item from their warehouse and the default is FBA shipment. Clear the cart and choose again the right variation. Sometimes this Error appeared when there is a Bug in Amazon systems, and the coupons will never work. If you get this error time after time, for different items, you might want to check with Amazon, maybe there is an issue with your shopper account. Please report the Amazon Promo Code, We will remove the promotion from the website after check. Expired Coupons means that the seller deactivate the coupons from Amazon and there is no way to claim them. Every Promotion on Amazon has its own start date and hour. Even when the seller creates the promotion and he sees it as active, it takes 4 hours for the promotion to be active. if you get the message that the promotion not yet begun, wait 4 hours and try again. 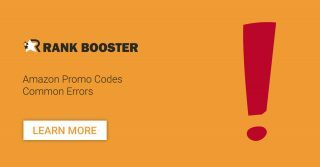 The Coupon is One-Time-Use Promo Code and already redeemed by other shoppers. Please report the Coupon and we will remove the promotion after check. First – Refresh! If you have not used that code before or purchased the same item with a different code from the same group codes, the discount will work. If nothing work, please mark the code as not working, and choose the error in the drop-down menu so the seller will be able to send you a new code. Hi, “Cannot be applied” is a general error, please mark the code as not working and choose “Expired coupon” in the drop-down menu. I found some neat items I really wanted and the coupons were expired. Made me sad, Hope Sellers message me with new ones. Sad part is, I used up one of my Requests for non-working coupons and that isn’t fair. We should get those Requests back if coupon not working. Hey Amber, I’m very sorry to hear that. We recently changed the product pages and it’s now including information about how many coupons have been sent and how many of them worked. I strongly recommend checking the product page before asking for coupons. We are doing our best to fight non-working coupons and again, sorry for the inconvenience. You definitely deserve to receive only working coupons on Rank Booster and I promise we will do our best to reach to that point. The coupon actually applied but instead of being $3.00, it actually totaled up to $4.20 and I have Amazon Prime so my shipping was free. I’m not sure if the discount hasn’t had time to actually go into effect or if this was just something that was overlooked. Please let me know if the item is $.00 becasue I was really interested in it and am willing to purchase it at that price.